Headlining the 2018 Dayton Celtic Festival with their Haven Album Launch Tour! Award-winning quartet We Banjo 3 from Galway, Ireland, combine Irish Music with Old-Time American and Bluegrass influences to reveal the banjo’s rich legacy and roots. When this band of brothers takes flight in a wave of virtuosity, verve , and joie-de-vivre, feet tap and pulses race. Enda & Fergal Scahill and Martin & David Howley are among the most celebrated and distinguished young musicians in Ireland today. Featuring banjo, fiddle, mandolin, guitar, vocals, and percussion We Banjo 3 make a bold and extraordinary musical statement. Creativity, sensitivity and passion are present in full measure and Irish music is at the heart of what they play. 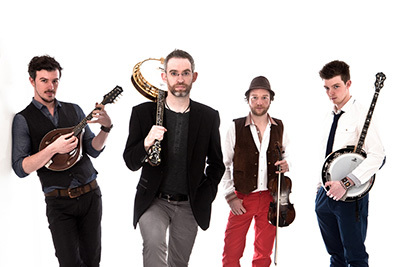 Collectively, We Banjo 3 have been at the forefront of Irish banjo and fiddle for 2 decades. Their competitive success is unrivalled, Martin holding 7 All Ireland titles, Enda with 4, while Fergal and David hold All Ireland titles on Banjo, Fiddle, Bodhran, and Guitar. Enda has recorded and performed with The Chieftains, Frankie Gavin, Stockton’s Wing, Grammy-winner Ricky Skaggs, and “Instrumental Band of the Decade” The Brock McGuire Band. Fergal has performed with David Munnelly, Martin O’Connor and Kevin Crawford and has toured the world with Ragus and Celtic Legends. Martin was the very first Irish banjo player to perform at the Grand Ol Opry in Nashville and David is fast building a reputation for his deep, muscular singing. We Banjo 3 play with swing and soul, effortlessly combining the best of Irish and Bluegrass banjo music and song, mining the rich vein of the American Old Time tradition and thoroughly reinventing the banjo band sound. Modern rhythms, traditional melodies, virtuosic technique, and innovative arrangements of music and song add up to an incredible feast of banjo and mandolin music – guaranteed to put a smile on your face and get your feet tapping. We Banjo 3 have released their debut album, Roots of the Banjo Tree, to critical acclaim. Do not miss We Banjo 3 at this years Dayton Celtic Festival!